- The foundation of nearly every Reading custom body is the Classic II™ service body. The Classic II™ is packed with so many standard features that it’s simply unfair to compare it with the competition. - Aluma-Fill®. Aluminum fuel fill receptacle protects the body from accidental nicks and scratches. - Heavy Duty Compartment Doors. 18 Gauge outer door skin with double paneled construction with internal reinforcement. 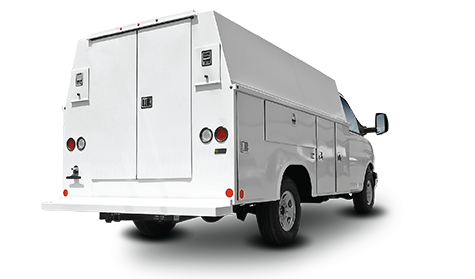 - All vertical compartment doors are equipped with Nitrogen Strut Door Holders where the internal dampeners control the opening and closing. - Slam Action Tailgate with a polished stainless steel handle and convenient pickup-style design. - Removable Stainless Steel Tailgate Knee Brace. Allows the tailgate to swing down completely. - Rugged Understructure. Fully unitized welding with U-beam girders braced and reinforced at all criticalpoints. Acrylic E-coat primed and coated with a tough water-based undercoating that meets all environmental regulations. - Exclusive Dual-Pro® Seal System. The patented design increases clear door openings in every compartment of the body. The large automotive quality bubble type seal and mechanical seal provide a dual line of defense against weather. - Complete Stainless Steel Rotary Locks. Attractive appearance with no exposed fasteners and rust resistant. Features a double bolted high quality locking cylinder, adjustable striker pins and an O-ring seal to prevent water intrusion. - A40-A60 Coating Weight Pressed Diamond Floor Plate Steel and Tailgate Inner Panel. Industry Exclusive A40-A60 Coating Weight Steel diamond surface provides additional corrosion protection & better traction. Patent Pending. - Patented Hidden Hinges. Industry exclusive overlapping door construction resists forcible entry. - Adjustable galvanized steel shelving.